Lights Off, Blankets Out: Lyrid Meteor Shower Peaks Tonight : The Two-Way Conditions on Friday night and before dawn on Saturday should be ideal for spotting the streaks of space debris — leftover particles from a comet that was last seen in 1861. 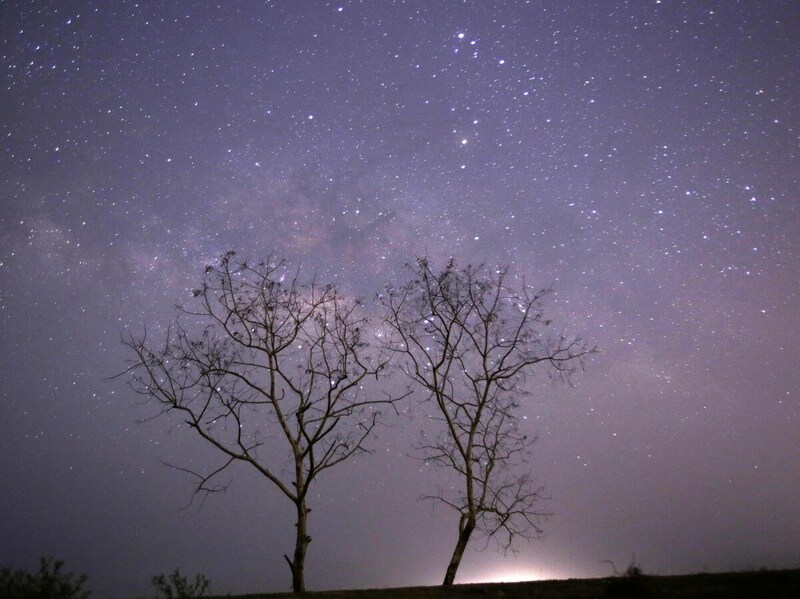 This long-exposure photograph taken on April 23, 2015, on Earth Day, shows Lyrids meteors shower passing near the Milky Way in the clear night sky of Thanlyin, Myanmar. Not all of April's showers are soggy and flower-inducing. Late April is also the season of the Lyrids, the second of the year's established meteor showers. So get thee to the rooftops and wide open fields: The shower peaks tonight. Summer Science: What's A Meteor Shower? Every April those space scraps hit Earth's atmosphere at 109,600 miles per hour, "vaporizing from friction with the air and leaving behind the streaks of light we call meteors," Astronomy Magazine explains. Meteor showers are named after the constellation coinciding with the area in the sky from which the meteors seem to emanate. Lyrids are so named because they appear to come from a point in the constellation Lyra. "If clear sky prevails Saturday morning (April 22nd), we might expect to see between 10–20 meteors per hour under dark, moonless skies. "The radiant is located in eastern Hercules near the border with Lyra, well up in the eastern sky by local midnight. Best viewing should occur between between 2 a.m. and dawn Saturday when Hercules rides high in the south. Expect little lunar interference — the waning crescent won't rise until shortly before the start of morning twilight." Space.com also predicts conditions will be "good-to-excellent" for North American skywatchers, as "25-day-old waning crescent moon will not rise until after 4 a.m. local time on April 22, thus assuring dark skies most of the night." Lyrids aren't generally as numerous as some other annual meteor showers, but they tend to be bright and fast. So wake early or stay up late, celestial searchers, and take NASA's standing advice: "Simply find a dark, open sky away from artificial lights. Lie down comfortably on a blanket or lawn chair, and look straight up." A previous photo used in this story that claimed to show meteors passing near the Milky Way has been replaced. The photo used information provided by Getty Images. It has been replaced with a different photo.